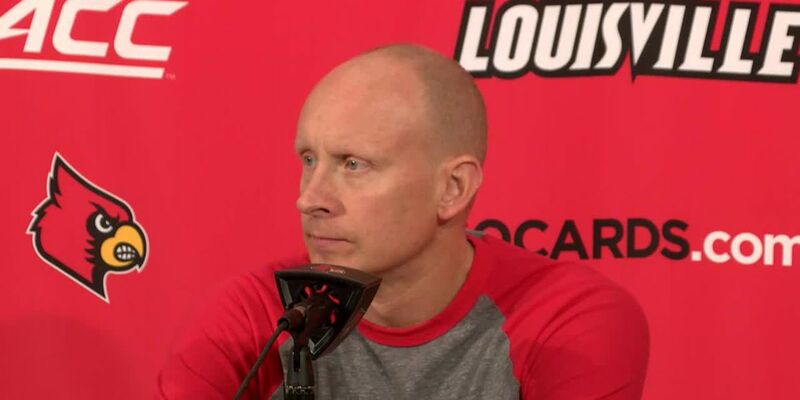 UofL men's head coach Chris Mack during his Feb. 1, 2019 news conference before the North Carolina game. LOUISVILLE, KY (WAVE) - In Saturday afternoon’s matchup, Louisville was looking to prove its marquee win in Chapel Hill last month wasn’t an anomaly. But Saturday’s re-match against North Carolina proved to be in many ways an exact opposite of the teams' first meetings, with North Carolina taking a decisive win, 79-69. Redshirt junior forward Dwayne Sutton led the Cards with 19 points and eight rebounds, as Louisville’s six-game winning streak came to an end. UNC out-rebounded Louisville 49-32 on the day, and shot nearly 43 percent from the field. They scored 18 second-chance points to UofL’s three. The Tar Heels' Luke Maye led all scorers with 20 points and 11 rebounds. Louisville trailed by 16, 44-28 at the break. In the first five minutes of the second half, Louisville showed spark, but a pair of UNC three-pointers kept the Tar Heels lead in double-digits. Louisville pulled down 13 rebounds in the first nine minutes of the second half, which topped the 12 rebounds they had total before halftime. Jordan Nwora, who averaged 18 points per game headed into Saturday, scored just 11 points on the day. Back-to-back three-pointers from Sutton brought the Cardinals within 12, 58-46, with 11 minutes left. And another Sutton three cut the lead to single digits with just more than ten minutes left. But North Carolina answered with a 10-2 run to extend the lead back to 17 and put the game well out of reach. The Cardinals shot just 35 percent from the field in the first half, while UNC shot nearly 50 percent (17-35). They were dominated on the glass, pulling down zero offensive boards in the first 20 minutes. Christen Cunningham led the Cards with nine points and five rebounds in the first half. He finished with 15 points and nine assists. Louisville (16-6) will hit the road to play Virginia Tech in Blacksburg on Monday, Florida State in Tallahassee on Saturday, before returning home to face the top-ranked Duke Blue Devils on Feb. 12.